Among my many travels to the various parts of India was an unforgettable trip to the Southern most tip of India, a place called Kanyakumari. This is the place where the Arabian Sea, the Indian Ocean and the Bay of Bengal meet, called Cape Comorin. 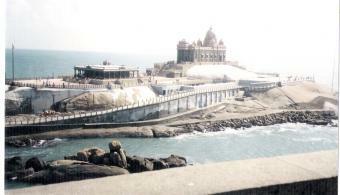 The name Kanyakumari comes from the local deity, a goddess Kanya Kumari (the Virgin). 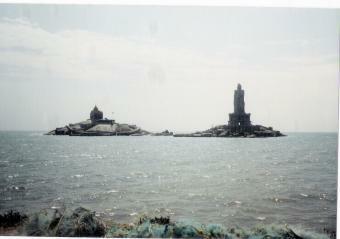 Kanyakumari is an important pilgrim center of Tamil Nadu. Many people come to visit the Kanyakumari temple that overlooks the shoreline and is dedicated to goddess Parvati as Devi Kanya, the Virgin Goddess who did penance to obtain the hand of Lord Shiva. If you plan to visit Kanyakumari, then prepare to stay there till sunset, so that you don’t miss the famous and spectacular sunrises and sunsets, especially on full moon day, which is the best in the month of April. This is the time when the sun and moon are face to face at the same horizon. Kanyakumari is a beautiful place with the beach having colorful sand, and a lighthouse that offers a spectacular panoramic view of the ocean. The most famous attraction of this place that everyone would have heard of is the Vivekananda Rock, which has a memorial on it, known as the Vivekananda Memorial and situated about 500 meters away from the mainland. There are ferries that take you to and from the place at regular intervals. 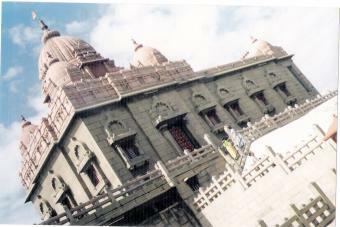 The Vivekananda memorial, built in 1970, is dedicated to Swamy Vivekananda who was one of the greatest social reformers in India. He had meditated on this very rock, where the memorial stands today. 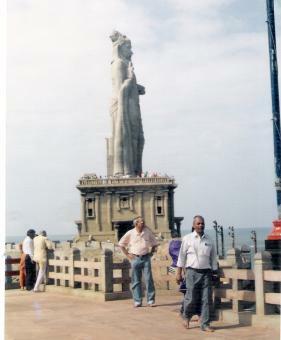 Standing on the rock, is the statue of a famous tamil poet named Thiruvalluvar who lived 2000 years ago, and one can also see "SRI PADAPARAI", the divine footprints of the virgin goddess. Among the many attractions of this beautiful place, is also a water amusement park for tourists. We went there for a picnic and had a blast. There were many exciting rides for all types of ages and lots of fun things to do. The park has both dry and wet rides in the same place. It also has restaurants inside the park, so that you need not have to carry any food. We spent the whole day there, and the kids really enjoyed themselves. The place has many shops for tourists all along the beach side offering all types of interesting articles made of seashells, and palm leaves to buy as memoirs. Unfortunately, the tsunami that ravaged the coasts of various countries in South and South East Asia, on 26th Dec 2004 also affected the Kanyakumari district (one of the worst affected). Yes you are right, it is indeed the statue of the tamil poet Thiruvalluvar, as you mentioned. I have corrected my mistake. Thanks for bringing it up.